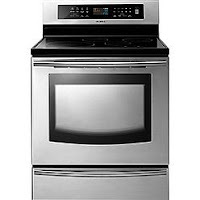 The appliance of the week is the Samsung Flex Duo Convection Oven model FE710DRS. This free-standing electric range is available in stainless steel only, and continues Samsung's tradition of innovation and making maximum efficient use of space. First, there's styling. The Samsung FE710DRS is designed with consistent cosmetic elements, such as the tubular handle with flat ends which is found on all other Samsung kitchen appliances with handles. The knobs are the same shape as any other Samsung range's knobs, but these are solid metal rather than the plastic knobs found on Samsung's entry level range. Controls are set on a glass touch panel for maximum durability and easy cleaning. A large window on the oven door gives you an easy view of what's cooking inside. The ceramic glass radiant cooktop houses five burners. In the rear center is a simmer burner, for keeping sauces warm or keeping chocolate melted. The two rear corner burners are both 6 inches and 1200 Watts, which is adequate for basic cooking tasks. The front left burner is a 6-9 inch 3000 Watt power burner, and the front right is a 9-12 inch 3000 Watt power burner. Plenty of power for bringing pots of water to a strong boil with considerable speed. There's a warming drawer, so you can keep food warm for entertaining or late arrivals to dinner. It's also good for warming plates for large gatherings. And, it serves as a special storage area. I'll get to that in just a minute. But, the oven is where the real magic happens with this range. If you look inside, you'll see two convection fans, one above the other. The top fan has a hidden element around it for true convection, while the bottom is a fan only. When you're cooking something large, like a 25 lb turkey, you can use both fans for dual convection. This reduces cooking time, improves the results, and makes you look like a great chef (which we already knew you were ;) ). Those fans aren't just there for cooking large items with convection, though. Take the special divider panel from the storage area in the warming drawer, and slide it into the channel designed specifically for it. It will click into place, and a blue horizontal line will appear on the control panel to show you that you are now in double oven mode. Now, you can run the top and bottom cavities independently. If you want to cook something small, like a pizza, use the top oven for faster cooking and great crispy crust. And, if you want to cook two separate things at the same time, you can do that, too. Use each cavity separately, and as long as the temperatures are no more than 75 degrees apart, you can cook different things at different temperatures at the same time. The secret is in the divider panel. It's made out of the same metal, porcelain, and insulation as the inside of the oven. That means it's able to withstand high cooking temperatures. If it should need cleaning, hand-wash (do not submerge), or use steam cleaning. Yes, this range offers steam cleaning in the oven. Pour a cup of water on the bottom of the oven, and use the "Steam Quick" option. Within 20 minutes, the water will turn to steam, softening and loosening stains from inside. This is great when you have company coming over and want the oven window to look good, or if you want to get fresh but tough foods off the bottom without the time and odor of a full self-clean cycle. Three racks inside allow you to use convection to cut baking tasks down to size. Because the oven racks are chrome, be sure to remove them from the oven if you're going to use the self-clean cycle. And, be sure to remove the divider panel as well. There are some great convenience options, like the "Chicken Nuggets" and "Pizza" settings, to make commonly baked items even easier to prepare. Even children can handle putting a pizza in the oven, pressing "Pizza," and pressing "Start." For a new standard in versatility and innovation in the kitchen, consider the Samsung Flex Duo Convection Oven model FE710DRS. With stylish looks, a powerful cooktop, and an oven that raises the bar for flexibility, this range can help you achieve your culinary goals with ease. 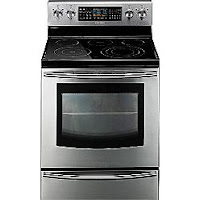 For about $300 less, there is the Samsung Triple Convection Oven FTQ387LWGX. This model is a single oven with triple convection (three fans with an element surrounding them all). Other than that, it has all the same features. Or, if you'd like the newest and greatest technology in cooktops on your range, give the Samsung Induction Range FTQ307NWG a look. It has four induction burners in sizes suitable for everything from small saucepans to 12-inch stockpots. The oven is the same triple convection oven that the Samsung Triple Convection Oven FTQ387LWGX has. All the cooktop burners are controlled with a simple touchpad on the cooktop itself (induction cooktops don't get hot like radiant ones). 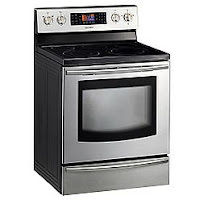 Maximize your time in the kitchen with this induction range.